The always popular and well located Oaks Oasis Caloundra has undergone a significant face lift, and unlike poor Aunt Patsy who tried a face peel and came out worse for wear, Oaks Oasis has risen like a Phoenix from the flames. This beautifully refurbished resort boasts a $4 million upgrade featuring completely renovated studio, one, and two bedroom apartments, a state of the art water park, as well as the “Oaks Oasis Adventure Zone” an interactive, open-air play zone for resort guests that features an 18 hole putt putt golf course, giant jumping pillow, sand pit, climb frame, BMX track, and trampolines! 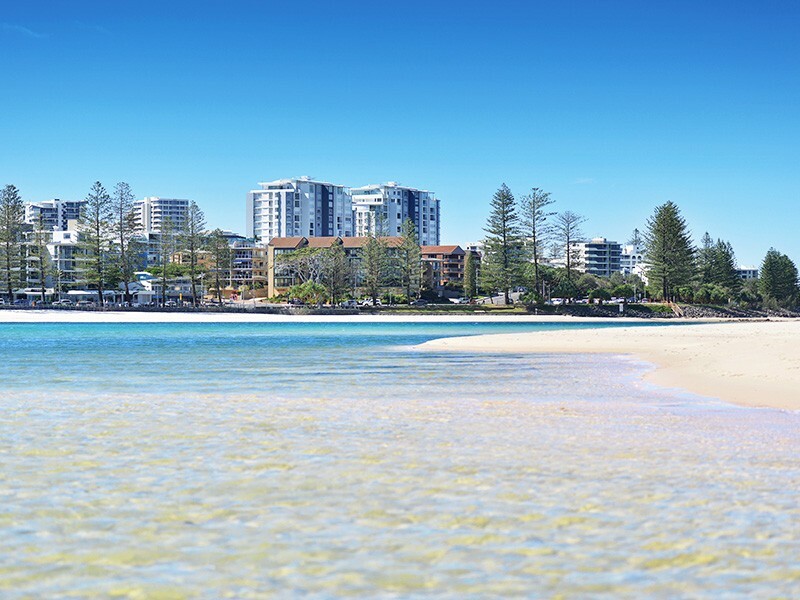 This development has created a unique attraction in the highly sought-after Caloundra – an all-inclusive destination in one of Australia’s most popular regions, the Sunshine Coast. The fabulous new addition to the resort, the waterpark, is nestled amongst the green area and the Oak’s famed centrepiece, the lily pond. 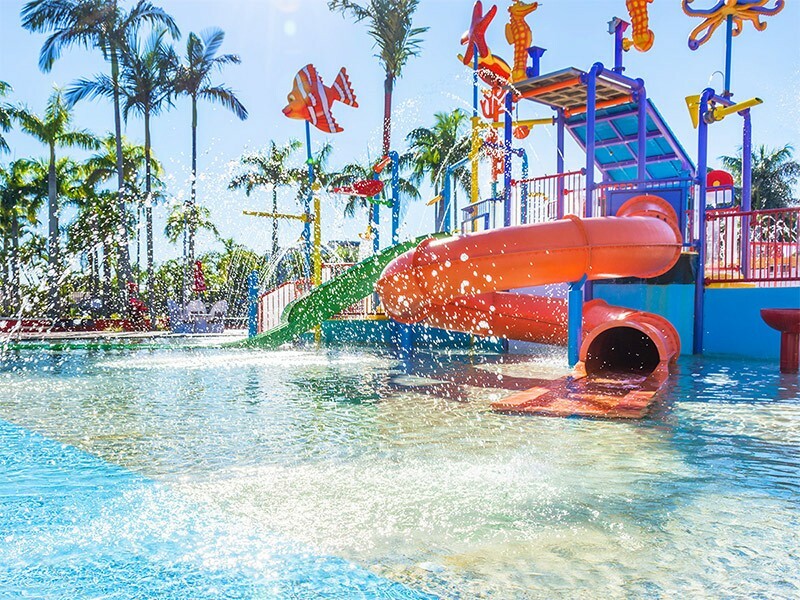 Covering a massive 500 square metres, the play zone is surrounded by a large splash pool and includes a multi-level water playground complete with slides, fountains, interactive activities, and a huge tipping bucket. The water park is fringed by the a lovely sun deck fitted with plenty of sun lounges for lazy days by the pool that are complimented by a licensed kiosk serving drinks and light snacks. To keep parents minds at ease, the water park is supervised by an attendant from 9am to 5pm to ensure safety, however, children are not permitted in the waterpark without a guardian over 16 years of age and should be watched at all times in the water. All suites in Oaks Oasis have undergone a complete renovation meaning you will experience modern and contemporary styling that is fresh and clean in every room. Our staff pick for families is the executive family room, it contains two twin beds, a dining room table, coffee making facilities, and a mini bar fridge. The bathrooms are spacious and well-lit, the beds are delightfully comfortable, and you simply cannot fault the cleanliness. Having a dining room table is an excellent addition to the room as it allows families to enjoy a casual meal. This is made even more convenient by the Woolworths grocery store directly across the road from the Oaks Oasis. Step out of the main entrance, and you will basically fall on top of the supermarket. Our Discover Queensland hot tip is to stock up on some snacks and basic meals, it’s not only great for saving $$ but it’s nice to not have the hassle of preparing the kids to eat out every meal of the day while on holidays. And sometimes barbeque chicken and avocado rolls are the only thing that’ll hit the spot! While the Oaks Oasis is now a much prettier version of itself, it has always been in a fantastic and central location. Just a stone’s throw from Golden Beach, and a 5 to 10 minute stroll from Bulcock Beach, you can certainly have your fill of water fun as you are spoilt for choice in the city of beaches. With six separate sandy nirvana’s you can literally stay for a week, see a new beach every day and save Sunday for the Caloundra markets. There is even a (not so) secret short cut to Bulcock Beach! Step out of the resort and turn right and you will find the Caloundra Waterfront Caravan Park which is gated, but open during the day (the gate has a sign with times the public can access this walkway) and takes you along a much more scenic walk to Bulcock Beach. While the resort is practically overlapping with Golden Beach, Bulcock is only a short stroll away, and you will find there is a lot more happening on this stretch of golden sand. Always a hive of activity, there are plenty of places to dine in or grab some take away fish and chips to enjoy by the waves. A popular evening pastime at Bulcock Beach is throwing a line in the water from the boardwalk. If fishing is not a usual endeavour for you, the handy Stockland’s Shopping Centre is located just across the road from Woolworths (another two minutes away from Oaks) and has a Kmart who stock plenty of adults and kids fishing rods at affordable prices (starting from around $10 approximately). The area is also host to a number of walkways that stretch for kilometres, making them perfect for bikes and scooters, so if you're driving to Oaks Oasis Resort then be sure to pack the bikes, scooters, skates etc. The kids will love adventuring down the paths finding new beaches, stopping for ice cream (there are plenty of vendors along the way) and getting out and about. There is also plenty to do at the resort. The refurbishment has seen the arrival of the hugely popular waterpark, but there are also volley ball and tennis courts, a lovely heated pool, and plenty of deck chairs and tables. There are also several grassy areas overlooking the beautiful lagoon filled with lily pads or the pool that are perfect for enjoying a book by, kicking a ball around, or having a picnic. 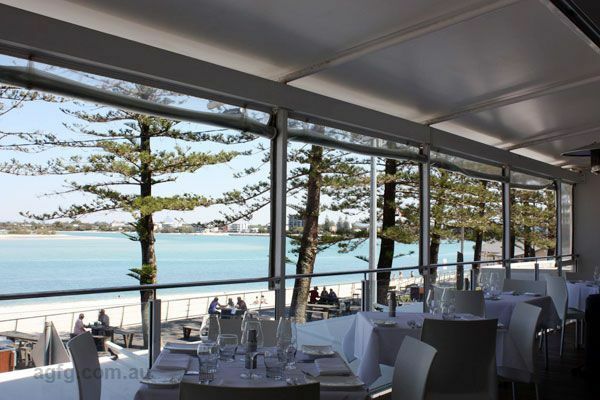 In fact some of the best family time to be had at the Oaks Oasis Caloundra is popping down to the beachfront, ordering fish ‘n’ chips or a pizza and settling in back at the resort in the evening in one of the picnic areas and watching the sunset over the behemoth play structure, or lily pond in the resorts friendly atmosphere. For fancier dinners and dining experiences, there are options a-plenty. Hogs Breath is located within walking distance and has a kids eat free night on Mondays and Tuesdays with kids drink and ice cream desert included! Dicky Beach Surf Club also does kids eat free on a Sunday night, with the Mooloolaba Bowls Club covering kids meals on Wednesdays. Bulcock beach has a myriad of flavours international and local along the waterfront, including our staff pick Wung Nam Thai Water Palace, which does an amazing green curry that’s not too hot. There are also a number of great eateries along Moffat Beach including a great cluster of boutique cafés next to the waterfront. No matter which direction you turn, Caloundra is filled with delicious cuisine, leaving no chance for you to be left hungry! Of course, for a more casual experience, you can always pop over to woollies, pick up some snags, steak, salad, and shrimp and throw them on the barbie while enjoying wine. 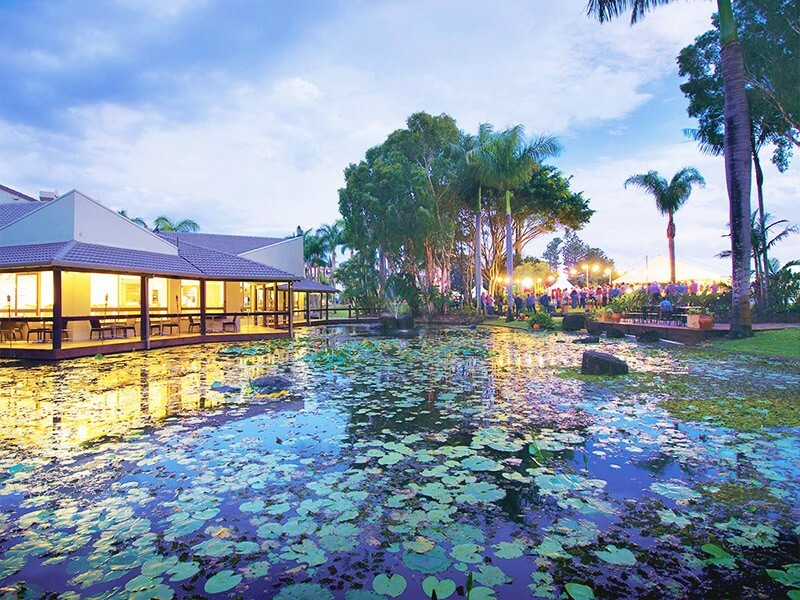 One of the perks of Oaks Oasis Caloundra is that there are so many options to choose from you can enjoy 5 star dining, throw a BBQ chicken on bread roll to enjoy at the dinner table, eat fish and chips on the beach, have sandwiches at a café, or barbeque up a storm in the waterpark. The options are endless. 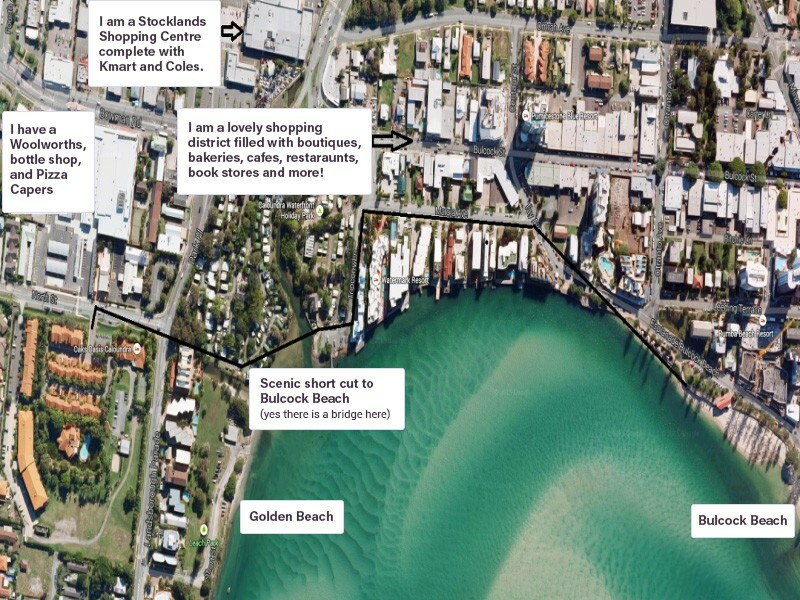 As you are strolling through to Bulcock Beach from Oaks Oasis you might catch a glimpse of Bulcock Street. A haven for shoppers, Bulcock Street is to Caloundra as Chapel Street is to Melbourne. It is filled with boutique shops, bakeries, cafés, restaurants, book stores, homeware nooks, and funky clothing alcoves. Of course there is also the Stocklands for larger or more practical purchases such as fishing rods for new adventures, or forgotten kids underwear! (Don’t worry, it’s happened to all of us!). 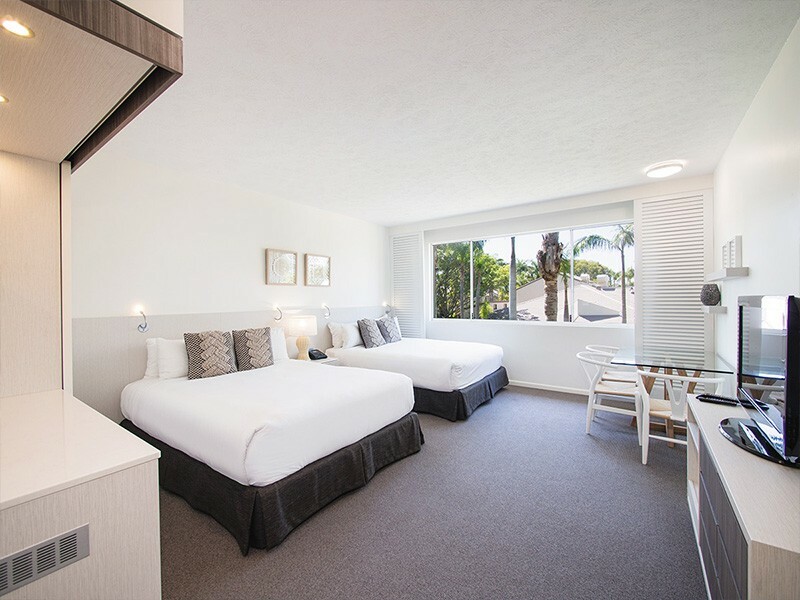 In terms of ambience, quality accommodation, shopping, dining, calm and safe beaches, and an amazing family holiday, Oaks Oasis Caloundra has nailed it. This freshly renovated resort boasts a beautiful and exclusive waterpark, proximity to beaches, dining, and attractions all while being a destination in itself. 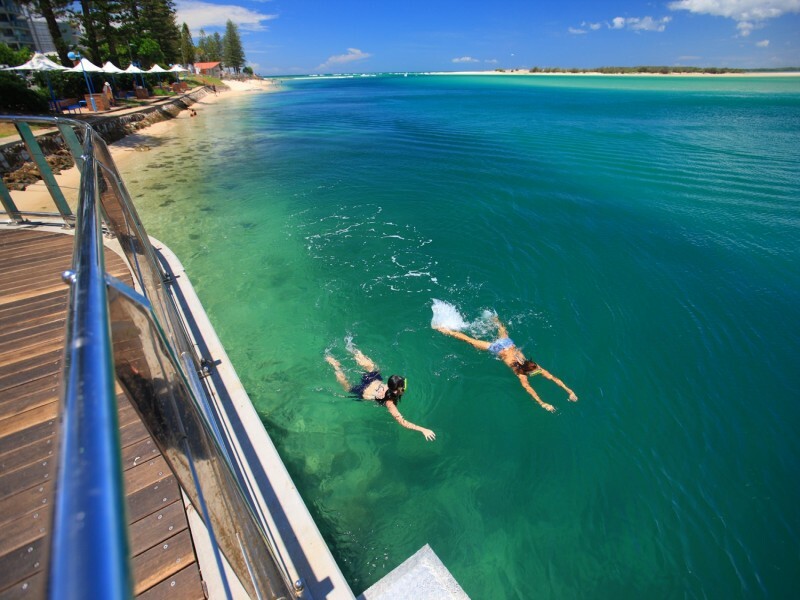 Book your next Caloundra holiday with the experts at Discover Queensland on 1300 788 553.